Mitochondria are essential to all higher forms of life. Every animal and plant depends on these small intracellular structures. 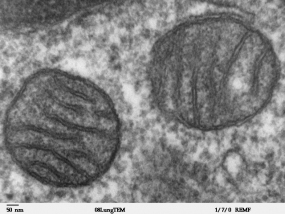 Mitochondria have multiple tasks: Since they generate most of the cell’s biochemical energy, they are referred to as the powerhouses of the cell. In addition, they are responsible for producing and breaking down amino acids and fats. They also regulate cellular death, called apoptosis. As a result, the spectrum of diseases that are linked to mitochondrial defects is wide, ranging from severe muscular and nervous disorders to neurodegenerative diseases as well as all symptoms of aging. “It was by pure chance that we discovered this completely new control mechanism of mitochondrial function,” says first author Deniz Senyilmaz, who works in Aurelio Teleman’s group at the German Cancer Research Center (Deutsches Krebsforschungszentrum, DKFZ). In collaboration with colleagues from Cambridge, Teleman and his team had planned to investigate the metabolism of long-chain fatty acids. For this purpose, the researchers bred flies whose cells were unable to produce stearic acid, a fatty acid that is composed of 18 carbon atoms. Animals with this defect did not develop beyond the pupal stage and were not viable afterwards. Teleman and his team were curious to find out why this happened. They then discovered a highly complex biological control mechanism that regulates the fusion – as well as fragmentation – of mitochondria and, hence, the performance of these organelles. The key element in this control mechanism is the transferrin receptor, which binds stearic acid. “For the first time in biological research, we have found out that stearic acid, which up until now has been believed to be simply a metabolic product, also has signaling function,” says Teleman. The researchers demonstrated that mitochondrial control via stearic acid works not only in flies but also in the HeLa human cancer cell line. When the researchers added stearic acid to fly food, the animals’ mitochondria fused; when they kept fatty acid levels low, the organelles fragmented. “If using stearic acid as a food additive improves the performance of normal mitochondria, then it might do the same in pathogenically dysfunctional mitochondria,” Teleman explained, describing their experimental approach. The researchers studied flies that exhibit Parkinson’s-like symptoms resulting from a mitochondrial defect in the PINK and Parkin proteins and are recognized as a model system for studying this neurodegenerative disease. When the affected animals were fed stearic acid with their food, their motor skills and energy balance improved and they survived for much longer.